"Anyone can write a blog post, but not everyone can get it liked thirty-five thousand times, and not everyone can get seventy-five thousand subscribers. But the reason we've done these things isn't because we're special. It's because we tried and failed, the same way you learn to ride a bike. We tried again and again, and now we have an idea how to get from point A to point B faster because of it." Three short years ago, when Chris Brogan and Julien Smith wrote their bestseller, Trust Agents, being interesting and human on the Web was enough to build a significant audience. But now, everybody has a platform. The problem is that most of them are just making noise. 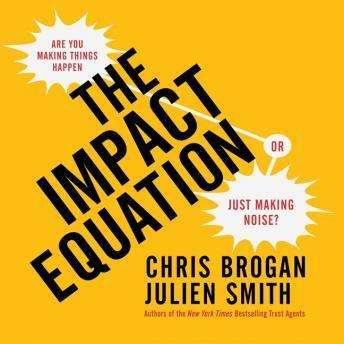 In The Impact Equation, Brogan and Smith show that to make people truly care about what you have to say, you need more than just a good idea, trust among your audience, or a certain number of fol­lowers. You need a potent mix of all of the above and more. Use the Impact Equation to figure out what you're doing right and wrong. Apply it to a blog, a tweet, a video, or a mainstream-media advertising cam­paign. Use it to explain why a feature in a national newspaper that reaches millions might have less impact than a blog post that reaches a thousand passionate subscribers. Consider the phenomenally successful British singer Adele. For most musicians, onstage banter basically consists of yelling "Hello, Cleveland!" But Adele connects with her audience, pausing between songs to discuss a falling-out with her friends, or the drama of a break up. Each of these moments comes off as if she were talking directly with you, and you can easily relate. Adele has Impact. As the traditional channels for marketing, selling, and influencing disappear and more people inter­act mainly online, the very nature of attention is changing. The Impact Equation will give you the tools and metrics that guarantee your message will be heard. Impact Equation: Are You Making Things Happen or Just Making Noise?